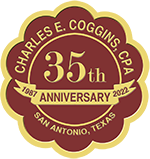 Charles E. Coggins, CPA, specializes in taxes for individuals and small businesses. As a Sole Practitioner, all work is done personally. Charles E. Coggins, CPA, will accept payment in either cash or check. No credit card payments will be accepted.